Jerry Prosser, Joe R. Lansdale, Neal Barrett Jr. 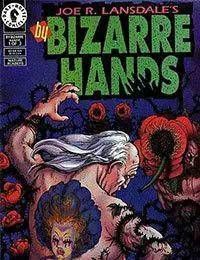 Tight Little Stitches in a Dead Mans Back, an after-the-bomb tale by the master of hard-core horror, Joe R. Lansdale, is the first of three short stories lovingly adapted for comics in this first issue of Joe R. Lansdales By Bizarre Hands. Terrifying, relentless, unsparing -- By Bizarre Hands is the extreme edge of horror.